Every so often I read a book that I don’t have quite enough to say about for a review…so today you’re getting a twofer with two mini-reviews! This is a decent book that I would have liked better if I hadn’t been expecting something completely different from what I actually got. I saw the cover and title, read the plot description and thought: story about an inept (and sparkly) fairy godmother? I’m so in! 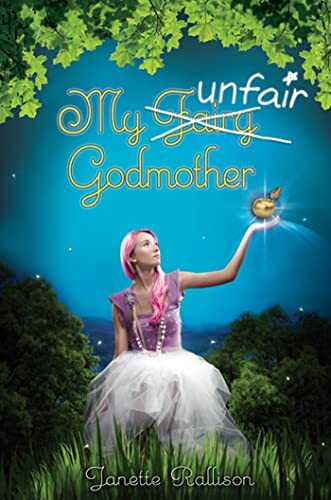 Turned out the fairy godmother was really more of a supporting character…part of her ineptness is that she’s never around to help, leaving Tansy to deal with the fallout of her wishes on her own. So really the story here is about a teenage girl coping with accidentally bringing Robin Hood and his Merry Men (more bandits than heroes) into her small town, and then with accidentally transporting herself and her family into a medieval-era Rumpelstiltskin tale. While fighting with her father, and crushing on her brother’s attractive but disapproving friend. All of that is reasonably entertaining, but not what I was expecting! And this turned out not to be as much my type of book as I was hoping. Even though this is a fantasy, Tansy is very much a modern, real-world teenager. I have nothing against actual real-world teenagers, but there’s a certain type of book-teenager…shallow, self-absorbed, fighting with her parents and having trouble balancing priorities (say, a fight with her boyfriend vs. stopping a government conspiracy…though that’s a different book). Tansy is not by any means the worst of this type I’ve seen—she’s fairly likable on the whole—but there was still a flavor of that type in here. There was a fair bit of whimsy and humor here too, and the inevitable romance had some nice moments. It was all a rather light froth of a book, which can be fun…although I did wish there was a bit more depth on at least one point. Tansy has some very real issues with her father, which is explored in the first few pages and made me feel sympathetic towards her…but then that never really got resolved. Storming a castle together as a family is not the same thing as having a serious heart-to-heart about how it felt when Tansy’s parents got divorced and her father moved out of the state. A demonstration of love doesn’t simply erase emotional damage. So don’t look for a lot of depth here, and don’t look for a story about a fairy godmother (all indications to the contrary), but it’s not a bad frothy modern fantasy…with a side-trip into medieval England. And incidentally, this turned out to be a sequel (to My Fair Godmother) which I haven’t read, but it didn’t seem to matter for following the story. This was another book I liked, but not as much as I hoped too—which may be a product of reading too many time-travel books, or just of liking a different kind of time-travel. 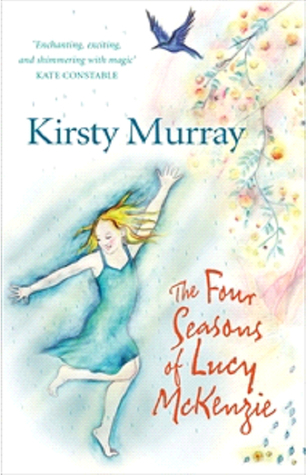 Lucy has to spend the Christmas holiday (in Australia, so it’s summer) with her Great-Aunt Big, in a ramshackle farmhouse in a secluded valley. The dining room has gorgeous murals of the valley—one season on each wall. And at night, Lucy finds that she can walk into the paintings, to meet April and her family living in the valley. This is a sweet story about family, and Lucy grows in confidence throughout the book in a nice way. It’s fun to read the Australian setting too, with the blistering hot January Lucy travels into for summer. So my reservations? It was abundantly obvious to me on paragraph one who April was…but I’ve read a lot of time travel stories, so I tried to be cool with that. And Lucy figures it out (relatively) quickly. My other issue is that I like dynamic time travel (actions in the past can change the present) and this was distinctly fixed time travel (the present can’t change and everything done in the past only creates the present as it already was). Fixed time travel just feels a little pointless to me because…nothing can be changed! Especially when Aunt Big’s life is a bit sad in the present. Lucy ends up understanding more by the end, but not enough for the understanding alone to be entirely satisfying to me as a reason for the time travel. However. All of that is pretty darn subjective, so you might not be bothered by those things at all. And even with those issues, this was a nice book, a very fast read, and ultimately there was an upbeat ending too. And I do love the idea of walking through paintings…such a cool concept.